Memorial Day is observed in Gilford each year, with the annual parade from Town Hall to Pine Grove Cemetery being an intergenerational experience. Historically, Memorial Day originated when Southern women scattered spring flowers on the graves of soldiers during the War Between the States. Using this symbolic gesture of “decorating” the graves of the dead, those Southern women honored the Northern d ead as well as their own dead -- and the seeds of Memorial Day were planted. Down through the years, Memorial Day has continued to be a special occasion for honoring the gravesites of members of our country’s armed forces who have given their lives for their country. But Memorial Day has grown also to be a time when non-military deceased loved ones are remembered and their gravesites are decorated. This year Monday, May 29th has been designated nationally as Memorial Day. As usual, Gilford’s annual parade will begin at Town Hall and conclude with services in Pine Grove Cemetery. Following the ceremony, the public is invited by Thompson-Ames Historical Society to come next door to the Rowe House. About 10:30 a.m., a brief ceremony will be held there on the edge of the Rowe House Gardens where T-AHS’s Rowe House Gardens Committee recently arranged to have Belknap Landscape Company plant a Sugar Maple Tree. 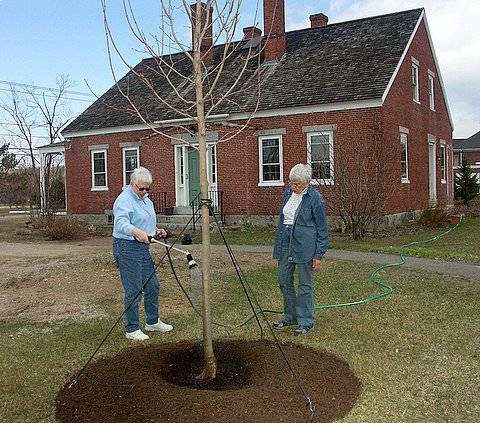 The tree has been planted in memory of Kathy Francke whose leadership efforts helped preserve Gilford’s historic Rowe House, a Greek Revival Cape constructed of bricks made on site, c. 1838. Tours of the Rowe House will be available and light refreshments will be served.